A must-read for the next generation of lawyers. Your copy is just a click away! The Legal Evolution Manifesto offers a new vision, a new ethic, and a practical method to help lawyers evolve without throwing away their careers. The manifesto speaks directly to the promise of millennial lawyers who are the future of our profession. The manifesto’s goal is to put the lives of lawyers on an arc of personal development within their current context, and to encourage law firms to become Deliberately Developmental Platforms (DDP’s) that break the invisible ceiling that is keeping Lawyers stuck in place. It acknowledges the truth of what’s going on with us, and works with realities instead of defending outdated mythologies. 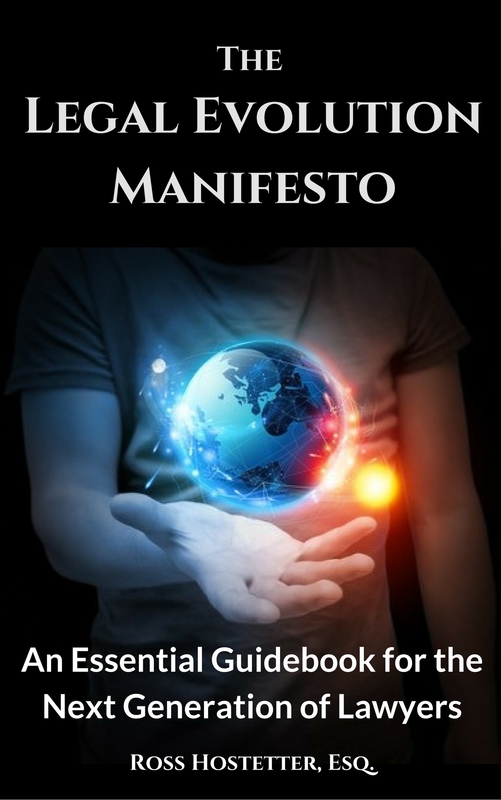 The Manifesto advocates of a new idea: a path of personal and professional evolution within the practice of law that includes but goes beyond the way of being a lawyer that we are now inhabiting, and leads lawyers to a more fulfilling life. The new freedoms that millennial lawyers will find as they break the developmental glass ceiling.